Two individuals from the UK have been arrested this morning under suspicion of leaking the movie The Expendables 3 onto the Internet. The men, from the north of England and aged 36 and 33, were arrested by officers from the Police Intellectual Crime Unit assisted by uniformed officers from local forces. 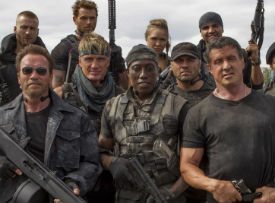 Earlier this year the movie The Expendables 3 leaked in extremely high-quality several weeks before its theatrical debut, causing a huge Hollywood controversy. A fully finished so-called DVD Screener copy of the action movie featuring Sylvester Stallone, Jason Statham and Arnold Schwarzenegger appeared on July 25 and had already been downloaded millions of times before its official release August 15. In the U.S., movie distributor LionsGate has been working hard on the legal front, chasing down alleged downloaders and even suing file-sharing sites and domain registrars. News in just a few moments ago reveals that the hunt has traveled across the Atlantic. According to the Intellectual Property Crime Unit of City of London Police (PIPCU), two people were taken into custody this morning under suspicion of leaking The Expendables 3 online. Detectives from PIPCU traveled to Dewsbury, West Yorkshire, where they arrested a 33-year-old man. PIPCU detectives also arrested a 36-year-old man at his home in Upton, Wirral. PIPCU informs TorrentFreak that the men are believed to have “stolen the film from a cloud based system” before uploading it to the Internet. The statement raises important questions though. Were the men involved in obtaining the original leaked copy and, crucially, were they the first to leak it online? “The two suspects are believed to be involved in the leaking of the movie and are currently being questioned by PIPCU detectives,” is all PIPCU would tell TF, adding that the pair are being held at local police stations. Earlier this year Lionsgate collaborated with the owner of file-hosting site Swankshare in an effort to identify who leaked the movie. That site subsequently shut down but it’s possible that logs were handed over in the meantime. Whether this is the “cloud based system” referred to by PIPCU remains a mystery for now. “Today’s operation shows you the significant impact intellectual property crime has on our creative industries, with millions of pounds being lost as a result of criminal actions,” Head of PIPCU, Detective Chief Inspector Danny Medlycott said in a statement. It’s of some interest that the first suspects to be arrested in this super high-profile case are based in the UK. There have been no reports of arrests in the United States where the movie was made and being prepared for distribution.